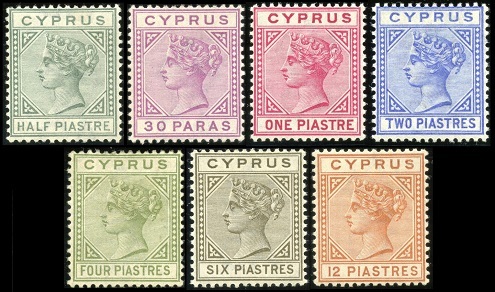 The first Cyprus stamps appeared in 1880. These first definitive postage stamps for the new British Protectorate were produced by overprinting the contemporary postage stamps of Great Britain. In 1878, following the end of Russo-Turkish War and the conclusion of the Congress of Berlin, the island was made a Protectorate of the British Empire, in exchange of guarantees that Great Britain would use the island as a base to protect the Ottoman Empire from further aggression by Russia. The island would eventually serve as a major military base, protecting Great Britain's colonial trade routes to Africa and Asia. With only one exception, the stamps of 1880 were denominated in British Currency. From 1881, all of the stamps, with a couple exceptions, were denominated in Turkish Piasters. 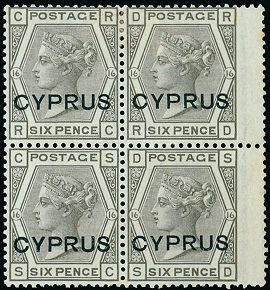 All of the stamps of Cyprus, issued between 1880 and 1896, bear the left-facing portrait of Queen Victoria. 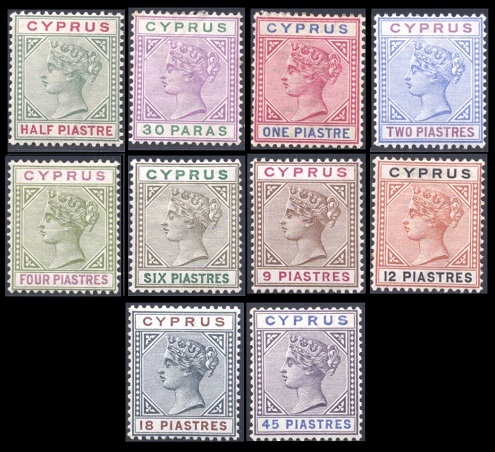 The six overprinted definitive Cyprus stamps shown above were issued in 1880. The paper watermarks on these CYPRUS-overprinted Great Britain stamps are as follows. 1/2 P. -- Wmk. Script "half penny". 1 P. -- Wmk. Large Crown. 2 1/2 P. -- Wmk. Orb. 4 P. -- Wmk. Large Garter. 6 P. -- Wmk. Spray of Rose. 1 S. -- Wmk. Spray of Rose. The plate numbers used to print these CYPRUS-overprinted Great Britain stamps are as follows. 1/2 P. -- Plates 12, 15, 19. 1 P. -- Plates 174, 181, 184, 193, 196, 201, 205, 208, 215, 216, 218, 220. 2 1/2 P. -- Plates 14, 15. 4 P. -- Plate 16. 6 P. -- Plate 16. 1 S. -- Plate 13. 1/2 P. (1880 - Sc. #1) - Rose. 1 P. (1880 - Sc. #2) - Red. 2 1/2 P. (1880 - Sc. #3) - Claret. 4 P. (1880 - Sc. #4) - Light Olive Green. 6 P. (1880 - Sc. #5) - Olive Gray. 1 S. (1880 - Sc. #6) - Green. 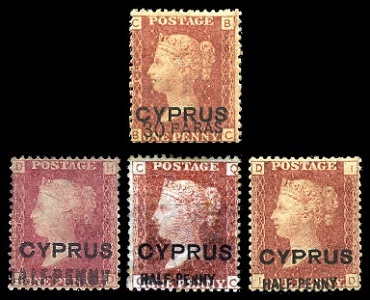 The four re-valued definitive Cyprus stamps shown above were issued in 1880 and 1881. 30 Pa. on 1 P. (1880 - Sc. #7) - Red. 1/2 P. on 1 P. (1881 - Surch. 18 mm - Sc. #8) - Red. 1/2 P. on 1 P. (1881 - Surch. 16 mm - Sc. #9) - Red. 1/2 P. on 1 P. (1881 - Surch. 13 mm - Sc. #10) - Red. The five new portrait definitive Cyprus stamps shown above were issued in July 1881. These were the first stamps to be produced with the name of the colony and the denomination, in Turkish Piasters, printed on them. These stamps are typographed on paper with a Crown & CC watermark and they are perforated 14. 1/2 Pi. (1881 - Sc. #11) - Emerald Green. 1 Pi. (1881 - Sc. #12) - Rose. 2 Pi. (1881 - Sc. #13) - Ultramarine. 4 Pi. (1881 - Sc. #14) - Olive Green. 6 Pi. (1881 - Sc. #15) - Olive Gray. 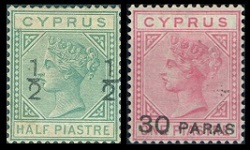 The two re-valued definitive Cyprus stamp types of 1881 shown above were issued in 1882 and 1884. The Scott catalog attributes, for stamps that are watermarked Crown and CC, are as follows. 1/2 Pi. on 1/2 Pi. (1882 - Sc. #16) - Emerald Green. 30 Pi. on Pi. (1882 - Sc. #17) - Rose. The Scott catalog attributes, for stamps that are watermarked Crown and CA, are as follows. 1/2 Pi. on 1/2 Pi. (1884 - Sc. #18) - Emerald Green. 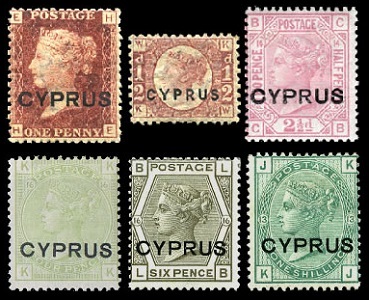 The seven portrait definitive Cyprus stamps shown above were issued between 1882 and 1883. All of these stamps were typographed on paper with the Crown and CA watermark. The plates for these stamps were produced from two different dies as follows. Die A -- The lines in the background vary in thickness and are not uniformly straight. There is a small dash in the upper part of the second jewel in the band of the crown. Die B -- The lines in the background are all thin and uniformly straight. There is NO dash in the upper part of the second jewel in the band of the crown. The Scott catalog attributes, for Die A stamps, are as follows. 1/2 Pi. (1882 - Sc. #19a) - Green, Emerald. 30 Pa. (1882 - Sc. #20a) - Lilac. 1 Pi. (1883 - Sc. #21a) - Rose. 2 Pi. (1883 - Sc. #22a) - Blue. 4 Pi. (1883 - Sc. #23a) - Pale Olive Green. 4 Pi. (1883 - Sc. #23c) - Deep Olive Green. 6 Pi. (1883 - Sc. #24) - Olive Gray. 12 Pi. (1886 - Sc. #25) - Brown Orange. The Scott catalog attributes, for Die B stamps, are as follows. 1/2 Pi. (1882 - Sc. #19) - Green. 30 Pa. (1882 - Sc. #20) - Violet. 1 Pi. (1883 - Sc. #21) - Rose. 2 Pi. (1883 - Sc. #22) - Blue. 4 Pi. (1883 - Sc. #23) - Pale Olive Green. 4 Pi. (1883 - Sc. #23b) - Olive Green. 6 Pi. (1883 - Sc. #24a) - Olive Gray. 12 Pi. (1886 - Sc. #25a) - Brown Orange. The two re-valued definitive Cyprus stamps shown above were issued in 1886. There are two types, with the difference being in the vertical measurement of the fraction numerals. Both types are shown above. Type 1 -- The figures in "1/2" are 8 mm apart. Type 2 -- The figures in "1/2" are 6 mm apart. 1/2 Pi. on 1/2 Pi. (1886 - Type 1 - Sc. #26) - Green. 1/2 Pi. on 1/2 Pi. (1886 - Type 2 - Sc. #26a) - Green. 1/2 Pi. on 1/2 Pi. (1886 - Type 1 - Sc. #27) - Green. 1/2 Pi. on 1/2 Pi. (1886 - Type 2 - Sc. #27a) - Green. 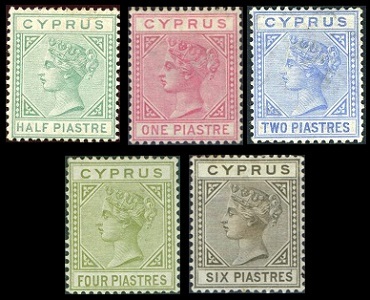 The ten impressive-looking bi-colored portrait definitive Cyprus stamps shown above were issued between 1894 and 1896. All of these stamps were typographed on paper with the Crown and CA watermark. 1/2 Pi. (1896 - Sc. #28) - Green & Carmine Rose. 30 Pa. (1896 - Sc. #29) - Violet & Green. 1 Pi. (1896 - Sc. #30) - Rose & Ultramarine. 2 Pi. (1896 - Sc. #31) - Ultramarine & Maroon. 4 Pi. (1894 - Sc. #32) - Olive Green & Violet. 6 Pi. (1896 - Sc. #33) - Olive Gray & Green. 9 Pi. (1896 - Sc. #34) - Brown & Rose. 12 Pi. (1896 - Sc. #35) - Brown Orange & Black. 18 Pi. (1894 - Sc. #36) - Slate & Brown. 45 Pi. (1894 - Sc. #37) - Dark Violet & Ultramarine.